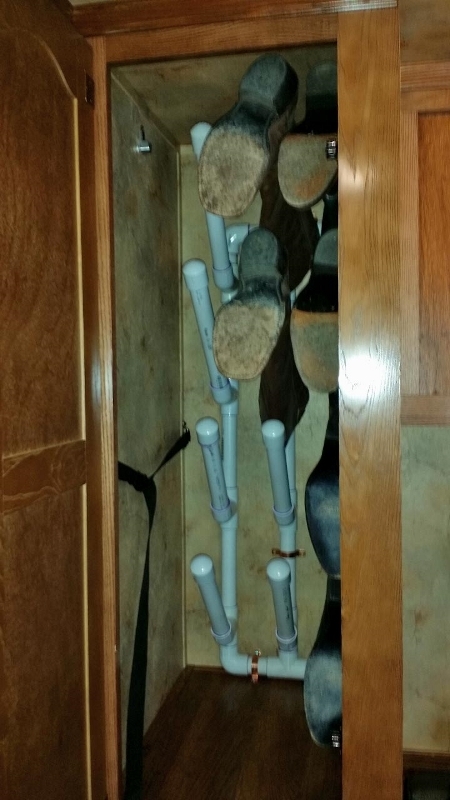 I devised this boot rack to put an end to the aggravating clutter of a half dozen pair of boots stealing the living space of a small space. Living full-time in an LQ Horse trailer is the Horseman's version of Tiny House living. I've got a hundred and seventy square feet of living space... maybe. I've got a couple less than that if my boots are scattered about in it! All it took was a couple sticks of inch and a half PVC pipe, some T's, some 45's, caps to finish the hangers smoothly and four elbows... a PVC cutter and the primer and cement. That and an hour or so's break in all this rain we've been having so I could cut all the pieces and put 'em together on the back of the truck. I spent a little while working out the dimensions and geometry of the boot rack. It had to fit through the door of the closet and still hold all the boots I needed to rack up. With pieces just pressed together and not glued I made some 'test fits' to check on fitting through the door as well as clearance with the closet cieling for getting the top boots in place in the closet. ... and I had all my boots stacked up alongside the bed up in the goose... an aggravating tangle... that and, boots and bedding don't mix well. Even for a dusty, sandy cowboy! CLICK! 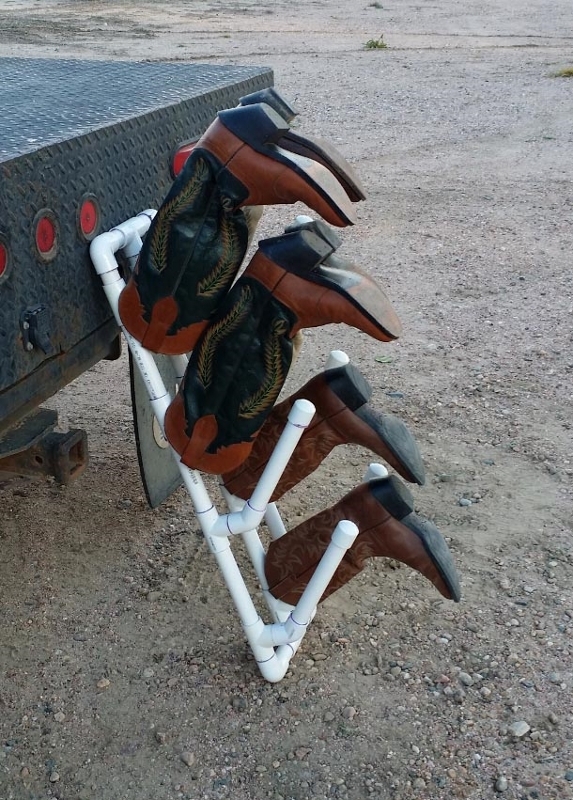 The idea hit me to devise a boot rack that would hold those boots up out of the way and easily accessed. You can easily see the configuration of the rack from this photo. The 45 degree couplers will keep the boots from sliding off when you're going down the road. Three verticals is what would fit the closet I had to use. (that stacks the pairs with one boot above the other) If you used one of the wider closets you could go four wide and put the pairs across side by side, rather than one boot above the other like I did... whatever floats your boat. The hardest part is getting everything lined up when you're assembling the parts. You only get maybe one try as you twist that PVC into position before the cement grabs and it's where it's going to be! Absolute precision isn't terribly necessary. I have one hanger that's a couple of degrees off. I hid it well in the photo. :) Once the boot's on there nobody can see my shaky "aim". Another consideration is how long to make the hanger "Shaft". I have two lengths. My tall boots have 16" tops, the regular are about 12-14". All you have to do is drop a tape measure inside the boot and get an accurate idea of how long a hanger that pair needs... and build accordingly. I built this pretty tight... it juuuuuuust wiggled through the closet door. To secure it in place I used pipe hanger straps and short screws. Some at the bottom and some at the top. 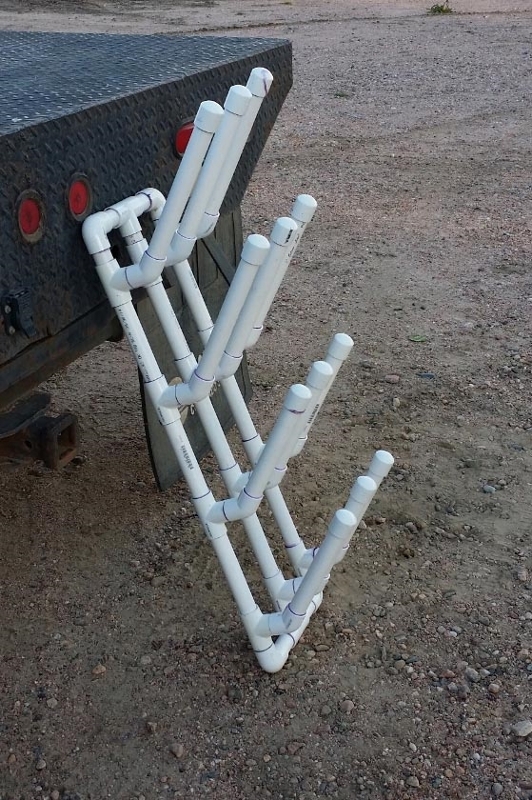 The worst that can happen is you mess up a few bits of PVC pipe working out your own Horseman's Boot Rack. But when you get it right, that'll be one less aggravation you have to deal with!